The waterblock I used is based on a cheap design that uses a 4 inch PVC end cap that has a Socket 7 heatsink sealed to the bottom inside of the cap. This is a rather cheap waterblock that I felt would be easy to make. I proably could've made a professional looking waterblock since I had access to the machines that could do it. The fittings on the final block are 3/8" brass fittings and 3/8" plastic elbows. I picked these up at Scotty's and I hear that brass elbows can be picked up at Ace Hardware. *UPDATE* I have swapped out the first block for a redone block that has a wider base for use with a cold plate and peliter. The water pump i'm using is a 145GPH Foutain pump I picked up at Home Depot. You wanna make sure you don't have to much flow through the water block or the heat won't be absorbed as well and system efficency will be brought down. 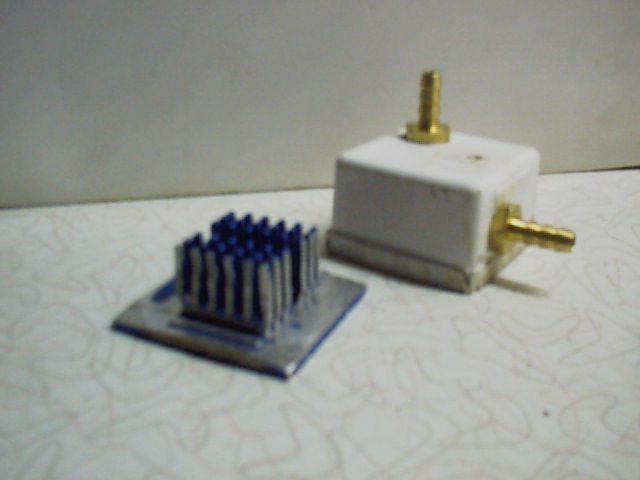 This is the first block that I made with an old Pentium 100 heatsink. The fittings are 1/4" brass fittings. 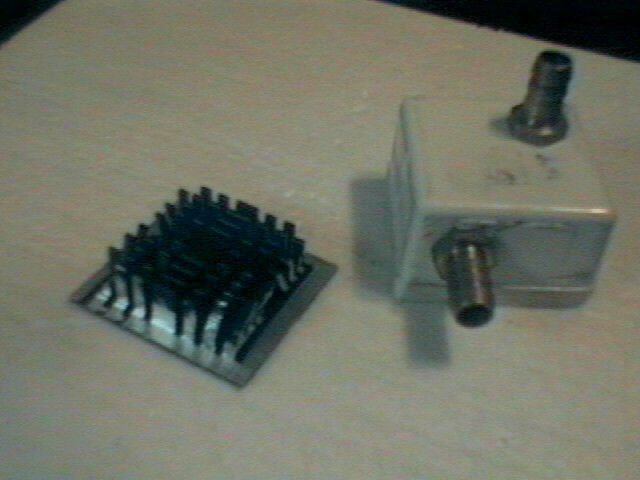 This is the block that I first started using with the peliters, so far it has done its job. 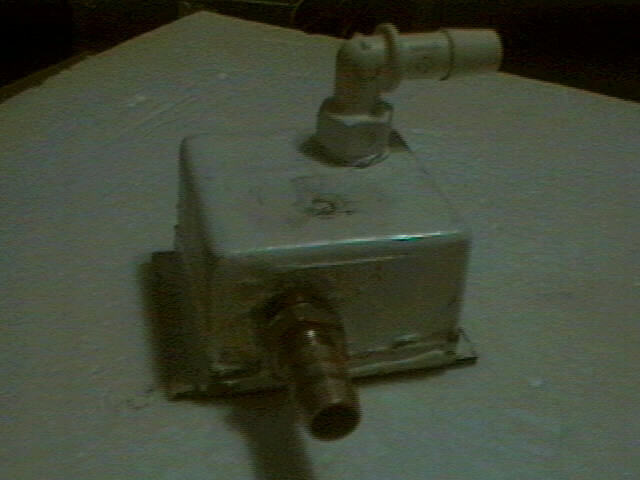 It has 3/8" fittings and the fitting on the top was replaced with an elbow like below because of my power supply. This is my newest block that I will be using with a 40mm peliter when I get it. Its built from my first block that had the 1/4" fittings.